Front Entry and slight view of horseshoe shaped driveway. Living room area looking out at the backyard. 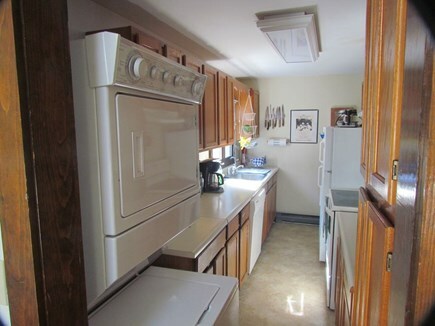 Galley Kitchen: Washer/dryer, dishwasher, electric stove, fridge. 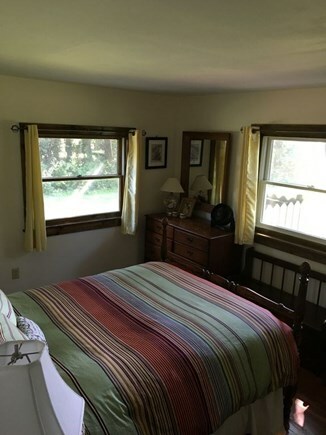 Bedroom #1 has a queen bed, armoire, and access to the deck. 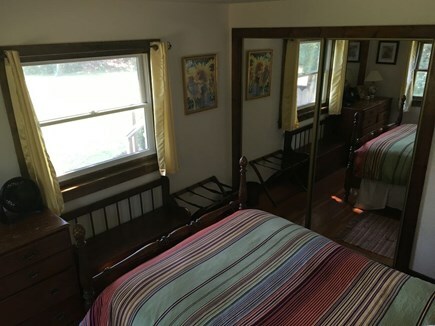 Bedroom #2 has two twin-sized beds. Bedroom #3 has a full-sized bed with large closet. Bedroom #3 second view with closet. Rear view of the cottage. 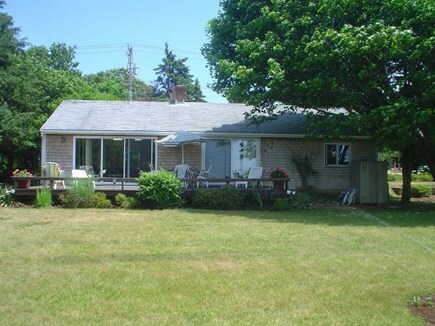 Front view from otherside of the cottage. Back of house. 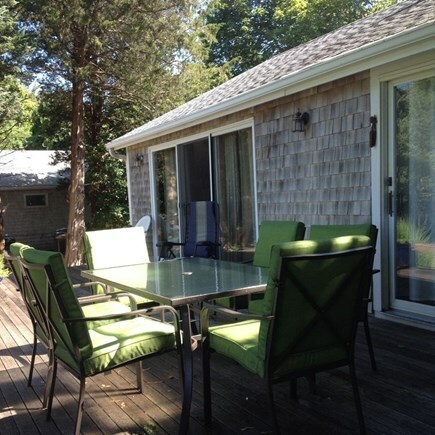 Deck runs the full length of the cottage! 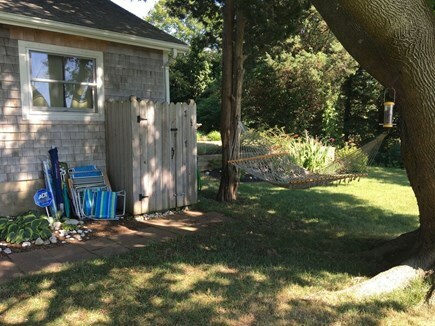 Beach chairs/umbrellas, outdoor shower and a hammock! Some friends that might pass through in the morning. 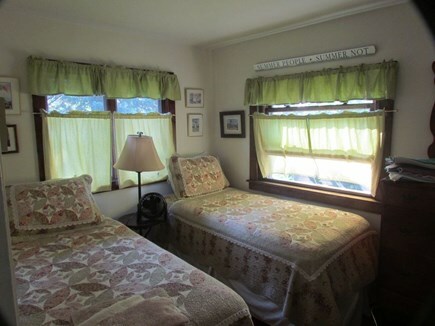 Consider staying at our beautifully landscaped cottage with water view. 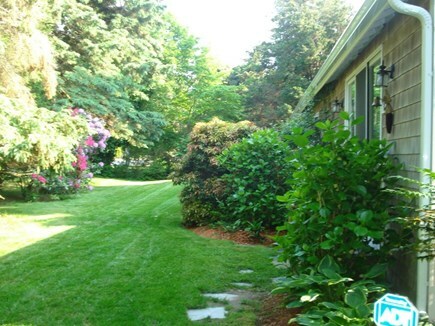 We are located right between Vineyard Haven (4 miles) and Oak Bluffs Center (2 miles). 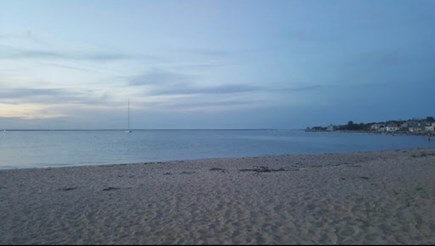 You’ll have easy access to the ocean, shopping and all of the amazing summertime activities on the Vineyard. Our cottage is equipped with three bedrooms, a great room, outside shower, full galley kitchen, hammock and your own private deck. You will have everything you need for a memorable get together with friends and family. 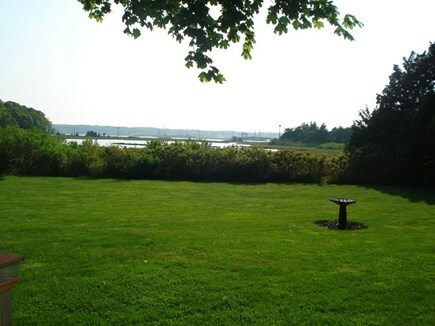 The site overlooks Lagoon Pond with an unobstructed view of Vineyard Haven Harbor, osprey nests and swans, geese and wild fowl feeding in Brush Pond. The house comes fully equipped with all items necessary for normal vacation usage including beach chairs, a charcoal grill and all kitchen equipment. 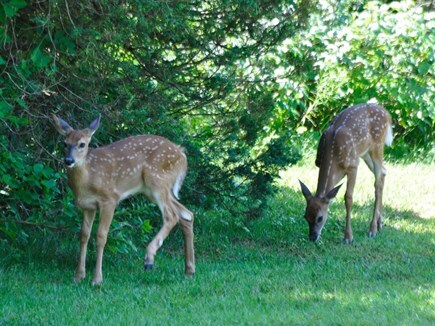 The yard is a favorite amongst our guests. Sunbathing on the back deck was my mother's favorite. Large deck, massive backyard and a beautiful daily sunset guaranteed. Additional availability info: Check in is on or after 4 pm, check out 11 am. This is a Saturday to Saturday vacation rental. Long-Term Rental (1 month or more): If you are looking for a long-term off-season rental - please inquire within. Please understand we will need you to initially meet with us at our property to show you around and we can exchange questions and answers. We will require references, both personal and business. We'll need to pull a credit report on you. Lastly, we will issue a long-term lease that fully spells out the details of the agreement. Additional pricing info: $170 wkly cleaning / $300 refundable damage deposit, State and local taxes of 11.7% will apply. It was exactly what we were looking for. Very comfortable and clean. 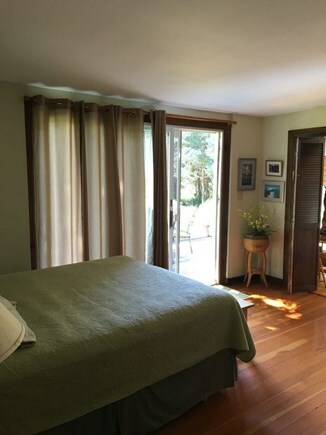 The house is in great proximity to the restaurants and shops in Oak Bluffs. It's about a 5 minute drive. Also, very easy to get over to Edgartown to see that part of the island (just a 15 minute drive). Overall, great house, great location, and great mini vacation. I recommend this place if you plan to the visit. My name is Angela March, I'm retired now, but I was the NYU Director of Financial Aid in the 80's and later DC Tuition Assistance in Washington D.C. I now live in Havre de Grace Maryland painting and enjoying time with my friends and family. 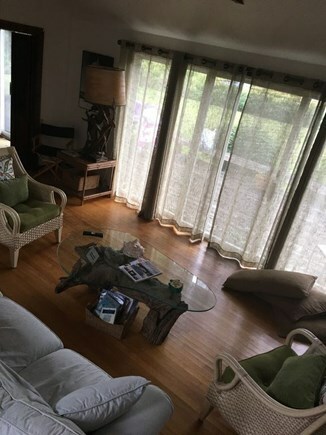 My niece Nichole Deas helps manage the property as well, she has a family of 6 and lives on the Southshore of Massachusetts so I can rely on her to be in real-time with care for our summer home. Nikki thinks she's a mermaid (because she is a sun, moon and ocean chaser). But I digress. We have been vacationing since the 1940's when my parents built our first house across the street from the house we are in now. The architectural plans cost them $25 dollars! Can you believe it? In the 80's we moved across the street to because it has a fabulous waterview. It has simply been a treasure in our family for 4 generations. Oh the large deck and massive backyard for sure. Also a beautiful daily sunset guaranteed. 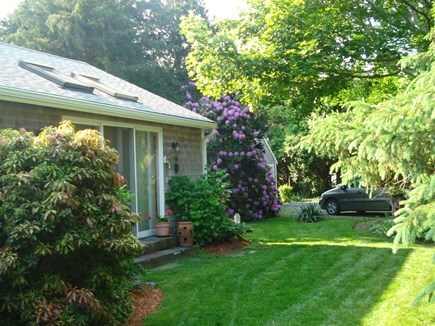 It is perfectly situated right in the middle of Vineyard Haven and the Oak Bluffs shopping and restaurant area. My niece is a terrific host and can help at anytime, just call or text. We also have a caretaker who is on the island 24/7. Between the two, you will be covered. You’ll have easy access to the ocean, shopping and all of the amazing summertime activities. The island shuttle buses to other island towns operate frequently and the our stop is within walking distance. Oak Bluffs has the historical ''Flying Horses'' carousel and you can tour the gingerbread cottages. Why even fly a kite on Ocean Park where they also have band concerts in the newly restored gazebo. Ideal for friends couples and families with children or teenagers nearby attractions: Beach biking, fitness centers, fishing, game room, boating, JetSki.